October 12, 2012 - Alaska Airlines on Thursday announced an order for 50 Boeing aircraft, including the 737 MAX—the new engine variant of the world's best-selling airliner. The aircraft, which will be delivered between 2015 and 2022, represent the largest order in Alaska Airlines' history and are worth $5 billion at manufacturer's list prices. The agreement includes firm orders for 13 Boeing Next-Generation 737-900ERs, 20 737 MAX 8s and 17 737 MAX 9s. "This order positions us for growth and ensures that we'll continue to operate the quietest and most fuel-efficient aircraft available for the foreseeable future. That means our customers will continue to enjoy a comfortable inflight experience, low fares and excellent on-time performance," Alaska Airlines President and CEO Brad Tilden said. "We value our longstanding relationship with Boeing and look forward to painting ‘Proudly All Boeing' on the nose of our aircraft for many, many years into the future." Alaska Airlines currently operates 120 Boeing 737s. The new firm aircraft order, plus 25 existing firm delivery positions, give the carrier the flexibility to manage its fleet size to meet air travel demand over the next decade. Two-thirds of the aircraft are expected to replace older airplanes. The remaining firm orders and options will enable Alaska Airlines to grow assuming sufficient customer demand and that the company continues to achieve its profit and return on invested capital goals. 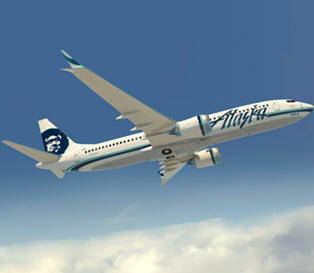 Existing and new orders for the 737-900ER will be delivered starting in late October 2012 and continue through 2017. The first 737 MAX 8 is scheduled to enter Alaska's fleet in 2018 followed by the first 737 MAX 9 in 2019. Alaska is the third U.S. airline to order the MAX. "The 737 MAX will be a great addition to Alaska Airlines' all-Boeing 737 fleet," said Ray Conner, president and CEO of Boeing Commercial Airplanes. "It will build on the strong record of operational and financial performance that Alaska Airlines has established with the 737 family. This order demonstrates our hometown partner's strong commitment to operate the most fuel-efficient single-aisle airplanes on the market today and in the future." All of Alaska's new aircraft will feature the Boeing Sky Interior, with overhead bins that provide more storage and passenger headroom, variable ambient cabin lighting and, on the 737-900ER, Recaro leather seats with an innovative design that provides more legroom. The 737 MAX will be equipped with the new LEAP-1B engine under development by CFM International, a joint venture between GE Aviation in Ohio and France-based Snecma (Safran group). The MAX will also feature raked "dual feather" winglets and a more aerodynamic tail cone. The aircraft is expected to be 13 percent more fuel efficient than today's most fuel-efficient single-aisle aircraft.